In an interview with Guitar Center, Taylor Hawkins' Foo Fighters kit is discussed: "Today, Hawkins plays a Gretsch USA Custom set with the Foo Fighters. For some recordings, he uses vintage Gretsch kits, but his USA Custom configuration, which has seen plenty of action both live and in the studio, consists of a 16x24" kick drum, a brass black-lacquered 6.5x14 snare, rack toms measuring 5x8, 6.5x10 and 11x13, two floor toms (14x16 and 16x18) and a Remo 14" Rototom above and between the two floor toms." The [official blog](http://blog.gretsch.com/tag/phil-collins/) of Gretsch Drums shows the original drumkits Phil Collins used. Pictured is Phil Collins Black Nitron setup. The article reads, "This was the classic left-handed Black Nitron setup used by Phil Collins on tours and recordings with Genesis and on his solo projects between 1989 and 2007"
In this photo, Ashton is seen with a Gretsch drum kit with a personalized bass drum having the Captain America shield with an "A" in the center of it. 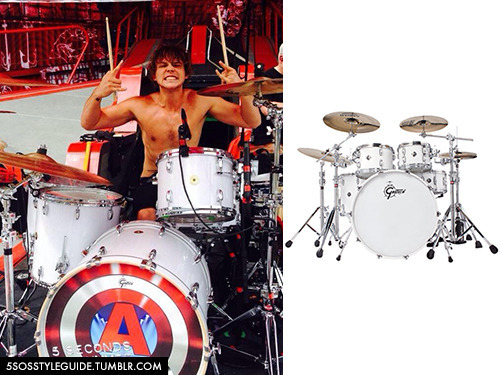 This is the drum set he mainly uses. He has that one in his practice room. Colour is orange. In that special TV show, Juanita talks about her custom made Gretsch kit, which is an effort to homage her father's Ludwig Octaplus. It features 10", 12", 14" and 16" concert toms a 22" bass drum and a 5½"×14" snare drum. "Doc’s also uses a vintage 7 piece, 1983 Gretsch USA Custom “Fusion 2” kit. His set-up is also open-handed, not unlike drummer Carter Beauford. Doc uses this smaller kit with Steve McQuarry’s new organ trio featuring guitarist David McFarland!" No reviews or videos yet for Gretsch USA Custom Drumkit. With an Equipboard account you can rate this item, add it to your collection, submit a review to discuss what you like and dislike about it, and associate Gretsch USA Custom Drumkit to artists that use it. Create an account!